rec. Reformatu baznica, Riga, November 1997-March 1998. 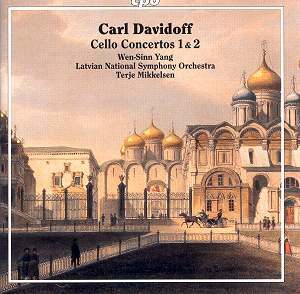 Carl Davidoff came from a comfortably off professional family in Goldingen in what is now Latvia. He succeeded Grutzmacher as professor of the Cello at the Leipzig Conservatoire. His pupils included Wilhelm Fitzenhagen, Hanus Wihan and Carl Fuchs. He was at one time principal cello in the Leipzig Gewandhaus. His First Cello Concerto can best be summed up as a cross between Schumann and Weber with a strong predilection for the singing Tchaikovskian line. There are some lovely melodies here. His lively rhythmic writing in the finale is also good. One can see where Saint-Saëns, Glazunov and Frank Bridge drew their inspiration. Clearly we have a virtuoso composer here but one who recognises the need for substantial ideas and emotions rather than death-defying feats. Davidoff also has the capacity to deliver emotionally-rounded ideas and development. The Second Concerto is more emotionally mature and is shaken by deeper Tchaikovskian emotions than the First. This does not mean that he has abandoned skipping carefree writing. We can hear this in the dapper finale with its elegant echoes of Tchaikovsky in the suites and the Rococo Variations. While Davidoff might have been considered the Saint-Saëns of his time, Tchaikovsky in his Rococo Variations is clearly a master with themes and resourceful treatments and transformations that leave Davidoff in the pleasing category ... no more. Nothing wrong with that. Wen-Sinn Yang gives all signs of having mastered the three works and with spirited sympathetic playing from the orchestra the effect is delightful. The chosen acoustic is full of life. There is no occlusion of the attractive incidents of these three works for cello and orchestra. The two Davidoff works should appeal to anyone who appreciates the Saint-Saëns concertante works for cello. Davidoff proves himself the troubadour of the cello with an interest in melody over mere pyrotechnics.